All is well and the day starts of considerably cheerful, you are feeling quite good humoured and you even find yourself singing along with the radio. It is a beautiful morning, the sun is beaming through the windows and above the sound of the song you are chanting along with the radio, you can hear the birds outside chirping to their own music. Another day at the office, not exactly where you want to be on a summers day so beautiful as this one, but that is life and it really isn’t all that bad where you work. There is always the positive and you are happy enough there, except for the person that sits behind you that you don’t get along with much, everyone else in the office is pleasant. You get to your place of employment a few minutes early, a habit of yours that you take a great deal of pride in. In comes the person that your really not fond of, they are a few minutes late and you can tell by the look on their face, there morning didn’t go as well as yours. They strut by your desk on the way to their own, and as they scornfully past you they scowl and mutter above their breath, ‘you think you’re so frigging perfect’, then they are gone. You try to swallow but there is some terrible distasteful energy lodged at the back of your throat, your smile turns to a frown, and instantly you feel a cool breeze, making you shiver a little. Thoughts begin to pour in, not very nice ones, and they aren’t about the person that just crushed your ‘happy’, the thoughts are about yourself, you are desperately fighting your water eyes pleading with yourself, ‘don’t make me cry, no, not now’! Your energy shifted when that person said what they did, you woke your Ego up, he has just dusted himself off and now he is letting you know how disgustingly hungry he is. His appetizer was the words that your horrible co-worker just belched at you, and now he is looking for more. ‘Why would they say something like that to me’, you ask yourself, ‘how mean’. ‘I don’t think I am perfect’! Now your Ego has it’s claws in a full grip and your thoughts are going wild. You spend way too much time chewing on what that co-worker said to you, beating yourself up all the while. It is going to be a long day, you think to yourself, feeling so upset and not able to snap out of it. But then you decide to ‘change your mind’. You know full well that what she said to you is her ‘stuff’ and not yours. It is not your fault nor does it have anything to do with you if she isn’t happy with her life. Your Ego begins to nod off, he is nearly asleep again. ‘That person is just mean, and not because of me’, you say to yourself. Their negative, rude and disruptive behaviour is no reflection of who you are. They are looking in a completely different mirror than you. You recognize that this other persons mirror is damaged and broken. 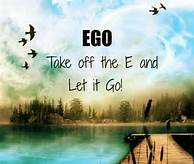 They have been allowing their own Ego to gorge consistently day after day, because they are so unconsciously unhappy. But that isn’t their fault, it seems like it is everyone else’s. The offensive and obnoxious co-worker has a beastly problem that they aren’t able to recognize, and that dilemma would be their repulsive and offensive Ego. Your smile comes back to your mouth, the song that you had been singing earlier comes back to mind and you settle in your chair for the day, ‘there is work to be done’, you say to yourself, and you don’t give the person that sits behind you, another thought.